A Young Boy In Niger Dreamed Of Being A Leather Artisan — And He Succeeded : Goats and Soda When he was 11 years old, Soumana Saley had never been to school — but he knew what he wanted to do with his life. Soumana Saley, a leather craftsman from Niger. He volunteered to be an apprentice. He kept it a secret from his parents, who were farmers. Leatherwork wasn't part of the culture of his ethnic group, the Zarma people. He didn't think they'd see a future in leather: "If your kid says, 'I'm going to have this success, are you going to believe them?" Every day, Saley told his folks he was going off to play with friends and instead went to learn how to craft leather goods. And that meant learning a lot of basic skills, too, like reading and writing and how to measure pieces of leather. When he finally told his parents, "they tried to convince me to quit," he recalls. "But I was not going to quit, because that's what I wanted to do." Three decades later, standing 6' 2" tall and wearing a rich purple tunic and trousers, Saley is one of the featured artisans at the Smithsonian Folklife Festival's new "Crafts of African Fashion" program, showcasing the work of "traditional master artisans." The festival takes place in Washington, D.C., on the national mall and ends on Sunday, July 8. 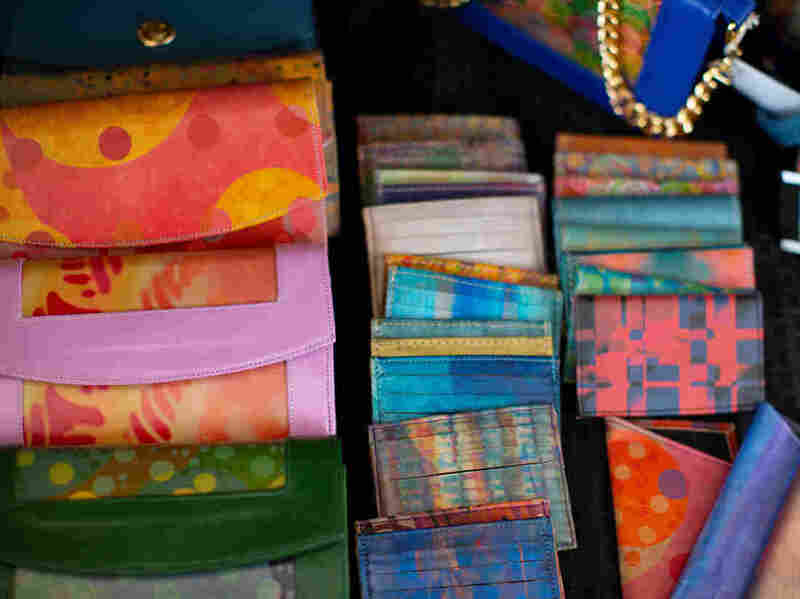 Saley is selling leather goods that start at about $20 for a small, multi-hued wallet and go into the hundreds of dollars for shoulder bags etched with striking designs. Leather wallets made by Saley. His 11-year-old self knew what he was doing. 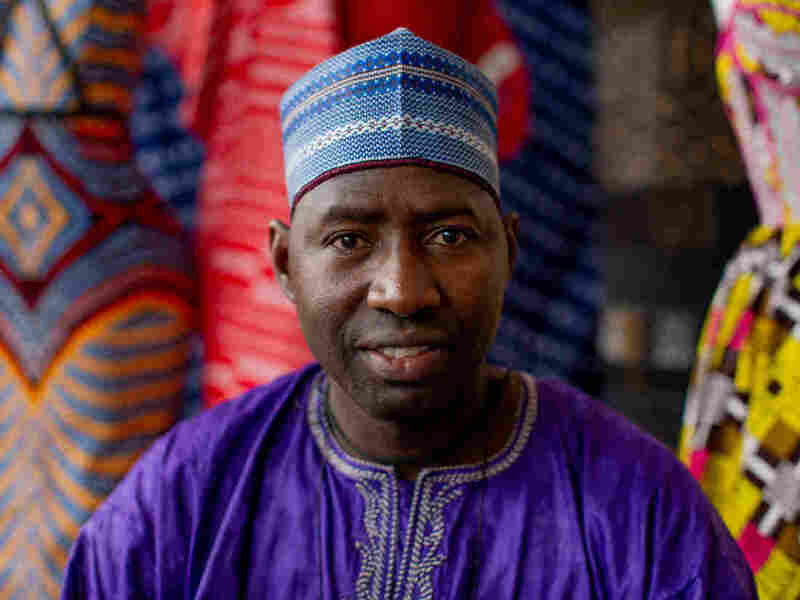 Diana Baird N'Diaye, senior curator and cultural heritage specialist at the Smithsonian Center for Folklife and Cultural Heritage, learned about Saley from the world-renowned Nigerian fashion designer Sidahmed Alphadi Seidnaly, known as Alphadi. He's a fan of Saley's leatherwork. When I met Saley, I wanted to know how hard it was for a young boy to learn the craft. Very hard, he says. Consider the task of "skiving" leather (shown above). The leather worker uses an extremely sharp knife to slice thin layers off a piece of hide so it becomes softer and suppler. If the surface on the table under the leather isn't completely clean, the knife will cut a hole in the hide and ruin it. When that happened to young Saley, he remembers "the boss was very mad." "It takes six months to learn," he says. "If you make mistakes, they can beat you." "Did you cut yourself by accident?" I ask. "Oh yeah, a lot," he says. "How do you know when you've sliced the hide thin enough?" I ask. Then he shows how the piece of lamb hide he's been demonstrating on, now as thin as a butterfly's wing, can be easily folded to make, say, a purse. Leather isn't Saley's only passion. After establishing a reputation for his leatherwork, he came to the U.S. in 2008. He hoped to continue his craft — and earn enough money to fulfill a vision he had. He wanted to start a school in Niger for teenagers who are not sure how to get ahead in life. Leather sandals, made by Saley, on display along with other items. In September 2017, Saley opened his school in Niamey to teach teenagers either tailoring or leatherwork but also literacy and numeracy. It's called DIMA — Dispositif d'Initiatives pour les Metiers de l'Artisanat. He says he pays for everything — rent for the building, salary for the teachers. The students attend for free. So a U.S. dollar goes a long way. Saley sends about $500 a month, earnings from his leatherwork and from jobs he's held in warehouses (in one stint, he replaced damaged labels on Frappuccino bottles). "It is a legitimate school," says N'Diaye, who is impressed by the focus on academics as well as the fashion-oriented instruction. Saley now lives in Millersburg, Pa. At the festival, he was accompanied by his wife, Jessica. He met and married her after coming to the U.S. But he didn't tell her about his leatherwork at first. "So you keep secrets?" I ask. "That's the way we are in Africa," he says. "The first time I meet you I don't have to tell you everything about me. I have to know you before I can open the door to you." He reflects on his journey from illiterate kid on the streets to master craftsman who displays his wares at craft shows in the U.S.: "If you don't believe in yourself, you're never going to have success." 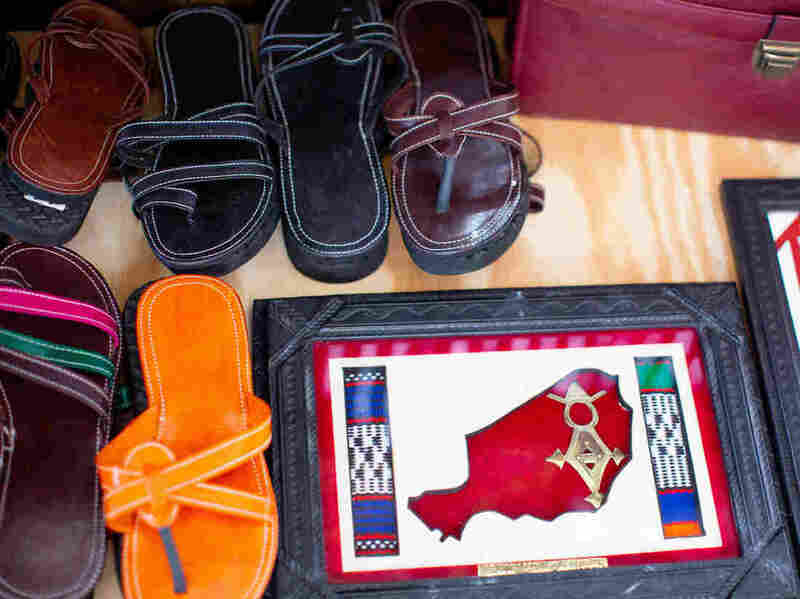 Saley is hopeful that the new generation he is training will keep crafts like leatherwork alive in Niger and earn a good living either as artisans or as businesspeople working with crafts. I couldn't help but wonder: Saley is not a wealthy man. What really motivates him to devote a monthly portion of his income to this school? So I asked. He doesn't pause a minute before answering: "These people, they need it more than I do." An earlier version of this story incorrectly referred to the practice of skiving leather as "scything" leather.